There are many ways that water can enter your basement. Water takes the path of least resistance and if that is through an area of your basement, that is where it will go. It isn't always easy to tell where the puddle has come from that you see on your basement floor. It may appear to be entering through the floor, however, the source can come from several places. Water can come in through the joint between the foundation footing and the wall, windows, foundation cracks, or from spaces around the steel form ties from when the foundation walls were poured. If you have seen water in your basement or notice any sign that you may be in need of interior waterproofing, contact the experts at Foundation Repair Services. We have the interior waterproofing solutions you need for your Oklahoma home. 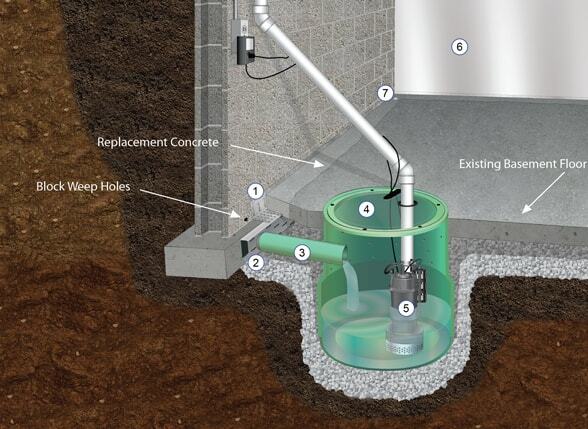 Foundation Repair Services installs sump pump systems made by Earth Contact Products (ECP), the leader in foundation repair and waterproofing products made in the industry. The ECP sump pump basin is the most efficient, safe and innovative designs available. It is molded from high strength, impact resistant polyethylene to provide years of service. The ECP sump basin has a unique bell shape, making it more efficient and increases the life of the basement drainage system. Part of the sump pump system is the actual sump pump. The sump pumps made by ECP include primary sumps from 1/3 to ½ horsepower that can pump up to 5,000 gallons per hour. The battery backup sump pumps that Foundation Repair Services uses made by ECP, are the most energy efficient lineup of 12 volt backup sump pumps on the market. Sump pumps remove water that has accumulated around and under the foundation and discharges it away from the foundation. Sump pumps are useful for all home that have basements. When rain comes and the soil around your home’s foundation gets wet, the water can leak into the basement. Sump pump pits, also called a basin, crock, or sump pit, are installed at the lowest point in the basement. When groundwater fills the pit to a given level, a float or switching device activates the sump pump. The water is then dispelled through the drain pipe to the outside away from the foundation and then the pit starts collecting water again. When the water table in the area surrounding the basement is higher, water will leak into the basement. Protect your home with an interior waterproofing system from Foundation Repair Services. It will save you money in the long run by maintaining the value of your home and protecting your investment. We have the experience and use the best products on the market for interior basement waterproofing. Contact us today and we will answer any questions you have and find the right solution for your basement waterproofing needs. We serve Muskogee, OK and the surrounding areas including NW Arkansas.